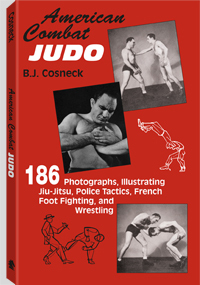 124 pages, 5.5" x 8.5"
Following his collaboration with Jack Dempsey on the WWII standard, How to Fight Tough, this 1959 solo effort by B J Cosneck, American Combat Judo, is a lengthier training session in vicious close-in fighting skills. In it, Cosneck combines elements of jiu-jitsu, boxing, wrestling, savate and plain old dirty fighting into an easy-to-learn set of practical unarmed combat techniques designed to incapacitate any attacker as quickly and painfully as possible. No collection of hand-to-hand combat books is truly complete without this exclusive reprint edition of American Combat Judo from Paladin Press. A champion intercollegiate wrestler and chief hand-to-hand fighting instructor for the U.S. Coast Guard, B.J.Cosneck is perhaps best known as the man who teamed up with boxing great Jack Dempsey to write How to Fight Tough for rookie Coast Guardsmen during the war.